Aerial photo by Dead On Design, courtesy of The Corcoran Group. 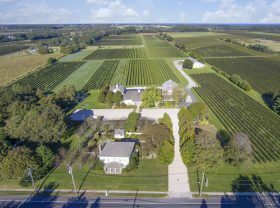 Situated in Cutchogue on Long Island’s picturesque North Fork, the historic estate vineyard owned by the late film executive Michael Lynne (“Lord of the Rings” trilogy) who was a key figure at New Line Cinema as well as a wine connoisseur is seeking a new owner. Asking $17.9 million, the 95-acre property includes a cottage and five parcels of land. The property is home to Bedell Cellars, a pioneering family-owned winery. Also included in the sale is the Corey Creek Vineyards winery.